Fishing Lake Erie provides some the very best walleye, bass & perch fishing in the world. Departing from Port Clinton, OH. Enjoy walleye fishing of a lifetime! Charter fishing with Lake-Erie-Fishing.com anglers can experience hands on drift fishing, casting spinners catching boat limits of walleye pretty much on a daily basis. This method of walleye fishing with light spinning tackle is exciting and thrills the experienced angler as well as the beginner. Fishing on Lake Erie with Captain Dave you can drift fish or troll in the western basin including the Island areas Kelly’s, Put In Bay and the western basin reef complex. This area of Lake Erie near Port Clinton is the center of the walleye capitol of the world. Captain Dave enjoys sharing his thirty-five plus years of Lake Erie fishing experience with his customers. Whether it is trophy walleye fishing, smallmouth bass, yellow perch or a day away. Call Lake-Erie-Fishing.com and charter Capt. Dave’s fishing boats. Put his angling expertise and crew of professional licensed guides to work for you on Lake Erie. Fishing the U.S. & Canadian waters of Lake Erie. Lake Erie is set for prime walleye fishing this fall and for the next 7 years! Lake Erie had a very good walleye hatch in 2014. Followed with a near record hatch in 2015 We handled 90 to 150 of these a day at times with a crew of six in 2016. These walleye will be the bulk of the catches in 2017. Three -year -olds. Size will range from 18-20 inches. Two to three lbs on the average. Full Size Furnished Mobile Homes located right at Wild Wings Marina. First Class Country Lodge – 3 miles from the marina. Our five completely outfitted fishing boats are the best anywhere. Lake-Erie-Fishing boats charter small groups 2 to 3 people on the Key Largo, 6 man charters on thirty foot Island Hoppers and larger crews on Coe Vanna IV and Cindy II pictured above will handle 7 to 10 fishermen! They are United States Coast Guard Inspected Vessels with a 12 FT. beam- fast- with lots of room. We take great pride in our equipment, reputation, and business. Booking four boats to better serve you. It is likely we have the open dates you are looking for. Our Captains, Guides, and Charter boats are among the best in the industry. Lake-Erie-Fishing.com offers Trophy Lake Erie Walleye Charter fishing in Ohio and Canadian waters from Port Clinton, Ohio. The western basin of Lake Erie walleye fishing is at it’s absolute best! Walleye are caught here by the millions every year. Drift fishing and trolling the waters offshore of Port Clinton. If it is smallmouth bass action you are after. South, Middle, and North Bass Islands are named after smallmouth bass and their waters offer premier areas to catch hundreds of smallmouth bass plus the western basin reef complex by our marina is teaming with bass! Fish a combo trip at no extra cost! Lake-Erie-Fishing.com departs near the western basin reef complex which allows us to offer you amazing combo fishing trips for smallmouth and walleye. Fishing on Lake Erie’s western basin loaded with millions of walleye has many advantages and our charter fishing policy is when you have caught your limit of walleye (or any other species) is not to bring you back to dockside early. If you limit out in a couple of hours (which frequently occurs). You may utilize the remaining portion of your trip to fish for another species or catch and release walleyes. Bring a premium ten-pound line for these acrobatic beauties. On average our smallmouth bass fishing trips turn 50 to 90 bass per day. Don’t forget Lake Erie’s tasty Yellow Perch. We catch them by the hundreds! 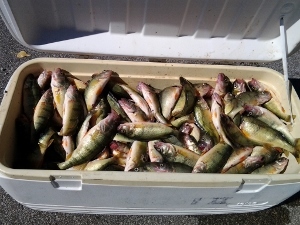 Daily limits of yellow perch on Lake Erie are thirty per person per day. Lake Erie perch fishing is anchoring up and catching them two at a time as fast as your line hits the bottom. Lake-Erie-Fishing.com will put you on the fish. We fish every day and are always tuned into the best fishing methods and areas at any given time. Our Lake Erie walleye fishing report page provides the latest information, Latitude, Longitude for buoys and reefs on the Western Basin of Lake Erie. Walleye charter fishing techniques, methods and current walleye locations. Along with free instructions for making Lake Erie’s hottest walleye lures – current weather conditions on Lake Erie. We fish every day and know where the schools are located. 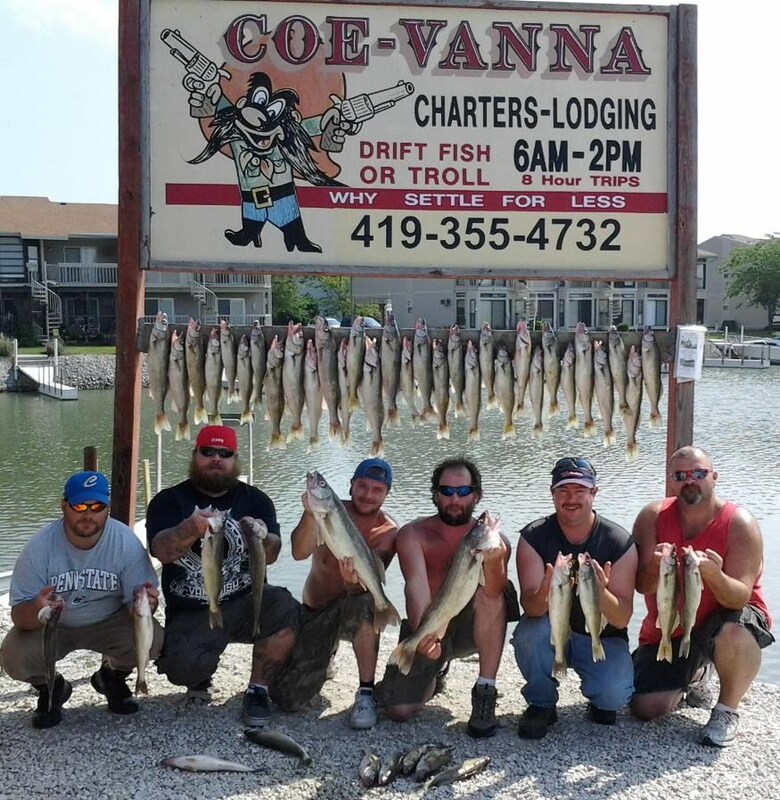 Coe Vanna’s Lake Erie charter fishing outfit is a Small Family Run Business Time Tested – Earned – Reputation as one of Lake Erie’s best fishing charters. Our charter boats will put you on the fish and into the action! 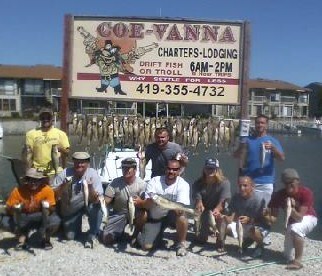 Coe-Vanna Charters – Port Clinton – Lake Erie Fishing at its very best. Give me a call and I will answer any questions you have. Go over what’s best for you. Text or call 419-355-4732 or E mail to coevannacharters@aol.com.